The president of Uganda his Excellency Yoweri Kaguta Museveni has ordered foreigners who had flocked the gold mines in mubende and Kasanda districts to vacate this area on grounds that foreign countries were benefiting more from the trade compared to Ugandans. 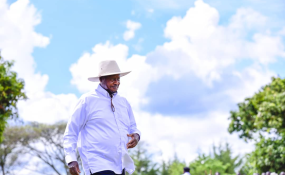 President Museveni expressed this during the youth day celebration at Umea primary school in Kikandwa village in Kalwana sub county Kasanda district; where thousands of artisanal and small scale gold miners were evicted last year, and remain unemployed until date. Museveni says that the eviction of the artisanal miners from the gold mines in Mubende district in August 2017 was inevitable because foreign countries were gaining from the mines more than Uganda. According to him, many of the miners in the Mubende gold mines were non citizens which made government lose out in terms of revenue. "The Congolese, Rwandese and Tanzanians who had come here for gold should first leave the country.Forests, lakes, rivers, gold and other minerals below the ground belong to all Ugandans. Individuals are not allowed to utilise these deposits without the consent of government who is the sole manager of these treasures. Unfortunately these artisanal miners went ahead to invade the gold deposits in Mubende district which had been licenced to AUC mining company thus destabilizing their activities," Museveni said. He insists that Artisanal miners have been a huge hindrance to the investor and government cannot therefore look on while resources meant to benefit all Ugandans are taken by the people from the foreign countries and a few Ugandans; "we cannot accept the artisanal miners to destabilize the investor who legally has a licence." These Artisanal miners who were evicted in mubende gold mines for the past one year and three months have made several efforts to return to the gold mines and the president made a directive for these miners to receive 30% part of the exploration licence area but up to date they have not yet returned the gold mines. The eviction of the artisanal mines came up following the presidential directive to evict all the artisanal miners in Mubende district on grounds that grounds that the people in the mines are not registered, government doesn't know the amount of gold they are getting out from this area, the people operating in this area are not Ugandans and increased environmental degradation which is a threat to the nearby communities. However the permanent secretary under ministry of energy and mineral development Dr.Stephen. R. Sabalija in the letter dated 02/august/2017 entitled statement on illegal mining activities in uganda explained that government is putting in place intervention measures whereby all the local artisans will be registered in all mining areas of Kitumbi and Bukuya sub counties so that they can be organised into groups that shall ultimately be regulated.